Chardonnayone of the few grapes in the world that does not require blending. A highly complex, aromatic grape, it is complete and balanced enough in flavor to stand beautifully on its own. Complete? Not unless she can snuggle with her favorite humans! She is a very cuddly girl who is great with people of all ages and she bestows lots of sweet husky kisses. Aromatic? Absolutely! Thanks to her foster mom's special touch, Chardonnay's wispy tresses smell lovely. Chardonnay appreciates a good bubble bath and a soft brushing afterward. Complex? This little girl has certainly been around the block in her short year of life. Kept in a garage most of her life, she is believed to have birthed two litters. Despite her early rough start in life and her premature push to adulthood, Chardonnay is an amazingly sweet dog. She is housebroken and takes treats gently. She has lots of love to give. She has a very playful side and especially loves to show this side of her in the snow. Does not require blending? 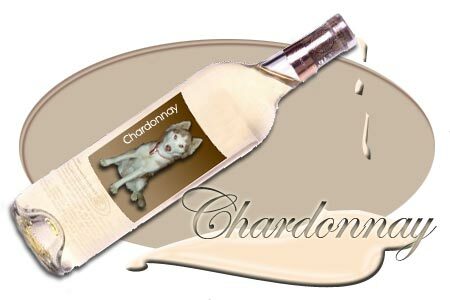 For reasons unknown, Chardonnay prefers not to blend with other dogs. We think she would do fine in a home with cats, but no dogs for her, pleasethis girl stands beautifully on her own! 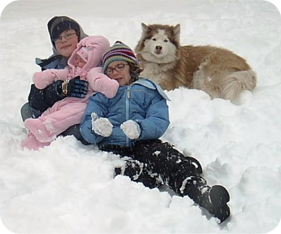 Miss Chardonnay has blended into the hearts and home of Michael, Norah, and their two children, who opened their home to her on February 22, 2003. Chardonnay is doing great! She has thickened up nicely and we think she is gonna be a bigger girl than we first expected. Her first night she howled and cried herself to sleep perhaps missing her foster Mom all so much! But when morning came she had our two little ones to play with, and boy did they enjoy each other. 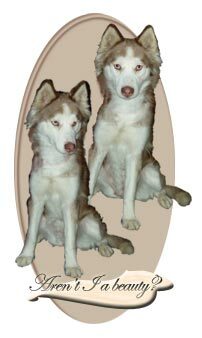 She simply has a great spirit and is one of the smartest huskies we have ever met. A bond has been formed with our 3 year old daughter and Chardonnay, a tight, prolonged - squeeze till it hurts (every five minutes) and all is fine with Chardonnay as she simply gives a good lick in return. She has become something of a protector of us and the kids. A bit odd for a Siberian. We think she has developed a strong "motherly" instinct in her other life having given birth to possibly two litters and had them taken away perhaps a bit too early. Hence the protective deep growls and barks when anyone enters our home or yard area. We thought of changing her name, but the kids said,"NO! She won't know who she is if we change her name" so it's stays. Our yard has been fenced in recently and the girl is ready to romp and roll, dig and wig out! Yesterday during a neighborhood romp, a car full of folks stopped, reversed and roll down their window to bask in her beauty, "She is GORGEOUS! they shouted and it's true. Our next update will include some pictures so everyone can see just how incredibly this girl is blooming this spring...Thanks so much to Kathy Lee and this great organization. Norah, Mike, Liam & Eilis McLaughlin...oh yeah and Chardonnay too! She is doing great, we are all having a blast! CHEERS! Hi there, I wanted to send a recent update! It is Chardonnay's birthday month. She is now 4 and doing great. Here is a pick of her hanging out in the weather of her choice! Once again thanls to the organization for bringing us this beauty. Chardonnay is doing fine, we have been lucky to have her as part of the family, she is 8 years old now and in very good health. She has a pannis type issue and has some vison problems but has been better as of late and has adapted when needed. She is a sweet dog and always gets compliments! See for yourself! Hello, it has been about 2 years now since the last update. Chardonnay has entered her old age stage but is still as vibrant and ready to play when the mood strikes her. She even learned to drive recently! 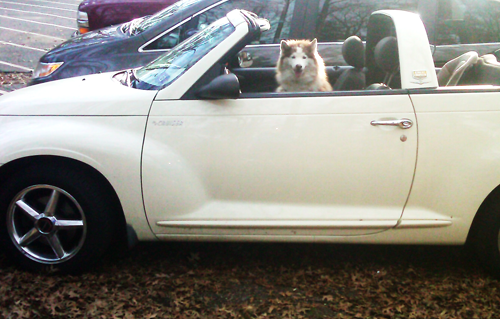 Such a smart breed, but the fur flying while the top is down is quite the distraction to fellow motorists. Take Care and keep your paws on the wheel!